Keckley globe check valves (center guided silent type) are suited for liquid applications only. 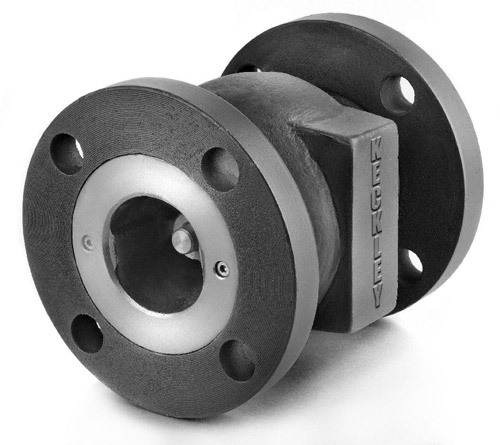 For applications requiring natural gas, steam, or vacuum service please refer to our wafer double disc check valve. 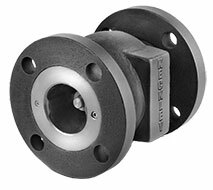 Globe style check valves are constructed from rugged castings that are machined to exacting specifications. Their bodies have drilled flanges that are in accordance with ASME. The spring automatically closes the disc at zero flow, which prevents flow reversal and water hammer. The disc is fully guided at the top and bottom to prevent binding and cocking. The valve disc will open with less than 1/2 pound per square inch pressure. All sizes feature discs, which lift 1/3 of an inch from their seats for every 1 inch of pipe size. 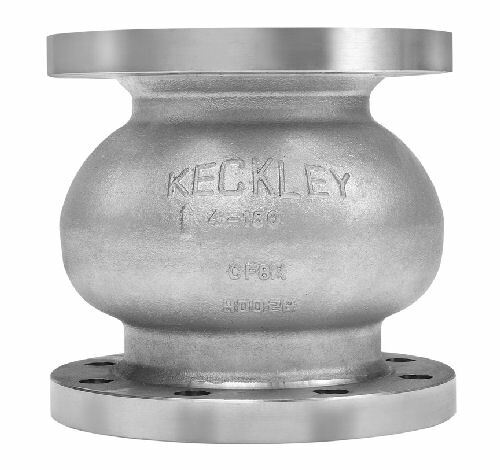 Keckley globe style check valves are full bodied and provide a very low pressure drop. Keckley supplies cast iron globe check valves, carbon steel globe check valves, stainless steel globe check valves and in a variety of specially cast alloys. 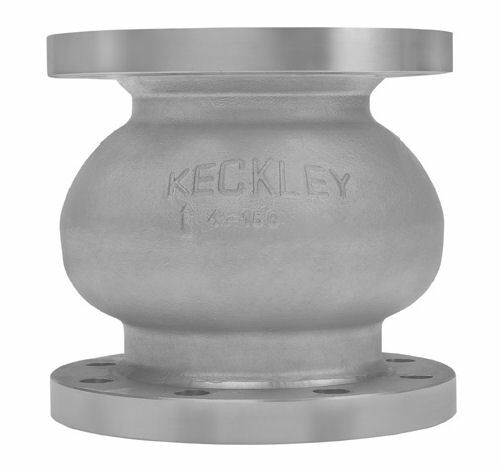 Keckley globe silent check valves are normally stocked and available to ship immediately with metal seats. Buna-n, Viton, and EPDM seats are available and would be machined at our facility in Skokie, Illinois. The standard discs furnished in all units are stainless steel. Keckley style check valves are field serviceable without the need for special tools. Keckley check style valves are designed to ASME specifications and tested to API 598 standards.